In 1996, the Personal Responsibility and Work Opportunity Act signed by President Bill Clinton barred legally residing immigrants from accessing Medicaid and CHIP benefits during their first five years of residency. The re-extension of these benefits was introduced by Senators Hillary Clinton and Olympia Snowe in 2007 as the Legal Immigrant Children’s Health Improvement Act. It was adopted as part of the Medicaid and Chip Reauthorization Act of 2009 as an optional expansion of the Medicaid program that allows states to extend Medicaid and CHIP coverage to documented immigrant children and pregnant women who meet other Medicaid and CHIP requirements. 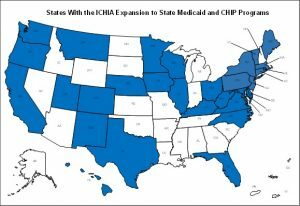 At this time, 31 states have adopted the ICHIA expansion, the most recent being Florida and Utah in March 2016. Insurance rates for immigrant children in those states was 62%, compared with just 21% in states that did not adopt the expansion. Latino children have disproportionately high rates of uninsurance due to the low-income and mixed immigration status of many Latino families, especially ones where children may be citizens or lawfully residing but parents may be undocumented. People without insurance are more likely to utilize emergency room services, but families with undocumented members are less likely to use emergency room services and more likely to forgo medical treatment altogether. The Medicaid and CHIP programs provide coverage of comprehensive preventive care, meaning better health outcomes for children, pregnant women, and infants. Youdelman, Mara. “Q & A: The Legal Immigrant Children’s Health Improvement Act.” National Health Law Program (blog). Entry posted June 1, 2013. Accessed April 15, 2016. http://www.healthlaw.org/publications/qa-on-ichia-the-legal-immigrant-childrens-health-improvement-act#.VxDwpPkrLcs. Georgetown University Health Policy Institute. “CHIP and Health Coverage for Lawfully Residing Children.” Georgetown University Health Policy Institute Center for Families and Children. Last modified March 15, 2106. Accessed April 15, 2016. http://ccf.georgetown.edu/wp-content/uploads/2015/06/ichia_fact_sheet.pdf. Schwartz, Sonya. “Research Shows that Utah and Florida’s “ICHIA Option” Will Improve Access to Health Coverage and Services for Lawfully Residing Immigrant Children.” A Children’s Health Policy Blog. Entry posted March 14, 2016. Accessed April 15, 2016. http://ccf.georgetown.edu/all/research-shows-utah-floridas-ichia-option-will-improve-access-health-coverage-services-lawfully-residing-immigrant-children/.